Unique clamping flange for a secure fix. Can drain upto 512 metres square at 10.72 litres per second. Grilles easy to remove for cleaning. All sizes quoted are internal daylight sizes. From Hunter Plastics the flat Balcony outlets are designed to last for years. 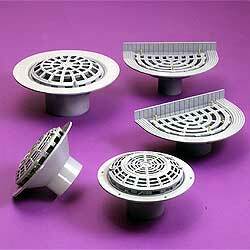 Manufactured in PVCu with three parts Funnel body Clamping ring Drain Cover To fit an 82mm pipe. Spigot Tail ..
From Hunter Plastics these Box Gutter Outlets are top quality designed to last for years. Manufactured in PVCu with three parts Funnel body Clamping ring Drain Cover To fit an 82mm pipe. Spigot Tail ..
From Hunter Plastics these flat roof outlets are top quality designed to last for years. Manufactured in PVCu with three parts Funnel body Clamping ring Drain Cover To fit an 82mm pipe. Spigot Tail ..
From Hunter Plastics these flat roof outlets are top quality designed to last for years. Manufactured in PVCu with three parts Funnel body Clamping ring Drain Cover To fit an 160mm pipe. Spigot Tail ..